Inspired by the Spirit Weavers Gathering in America and our deep desire to come together and celebrate our womanhood. Mother Roots is a sacred gathering for women. 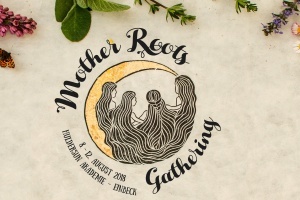 A gathering to reclaim our roots, reconnect to the earth, the pulse of sisterhood, the tradition of feminine crafts and feminine healing. It is a gathering where we learn the ancient feminine arts of rituals, herbal medicines, earth skills, weaving, crafting, music, dance, healing. Come and celebrate with us the gift of sisterhood and sink deep into the roots of the woman. We are hosting this Gathering for the third time in this summer. It will be a non-profit initiative. We strive to bring into life a community of us women, sharing and nuturing our sacred Womenhood with one another. Together we have the desire to build a foundation of new values. Authenticity, transparency, unconditional sister support and a collective nurturing through this kind of community. We wish for everyone to feel abundant and loved in this healing field. In here, we want to start to live a sisterhood that supports the common good – that is appreciating, not competetive. We will all do our utmost for this to be a meeting in which everything is invited to be, wishes to be expressed, heard and lovingly considered. Where each one in her essence is as important and great as the other. We need a lot of love, support and holding of the space to make this Gathering happen! My dearest Women, let us create something strong and wonderful! There will be a lot of space for tents on the soft grass and also we have group sleeping rooms available with limited matresses. You can also come with your own camping car. These options will have the same costs (‚Camping Pass‘) because the water costs, etc. will be the same. There will be inside toilets with warm showers as well as outside eco compost toilets and an outside shower, besides the beautiful river to bath in. a list of accommodation possibilities available to send to you. There are regular busses driving and probably we will have options to organize a shuttlebus/ car sharing. all of their love and dedication. Also this location provides us with an osmose water filter and water energizer. It will be most of all vegan, with some gluten-free (wheat-free) and raw options. If you have a certain strict diet please let us know so we can hopefully take care of that. The veggies will be delivered straight from a lovely ambitious guy of Naturkost Lindenhof who will prick in the exact plants that we ordered right now so that they will be ready by the time of the Gathering. Having seen the guy and his vision for this we already feel that the food will be planted with a lot of love and caring mindfulness. Please let us know if you are coming with children. For your kids please give a donation depending on the age and your estimation. Children from 16 are paying a normal ticket. We will have a kids space with care takers. As there is a small and still vivid river right at the edge of the location please bring water wings for your children for safety. We will call upon every woman to have an eye on kids playing in the water. There has never been any occurence and we trust in the collective care-taking mother energy. Still we felt it was important to let you know about that. Generally we claim self-responsibility for yourself and for your kids. There will also be an exclusion of liability letter for everyone to sign at the beginning of the event. We have put a lot of effort into balancing cost of location, a wholefood kitchen with experience of how to organise such a Gathering and thereby of course also following the risk holding high costs. When we decided to host the event at this location including secured kitchen facilities and other comfortable and safe circumstances, it was clear that this would imply certain costs. The place is so wonderful and in our view clearly worth the money. The vision is to organize an additional wilderness (Rainbow) Mother Roots Gathering next year, which would mean more freedom of money. So that women who live more or less money-free can also attend at such a Womens Gathering. Here at this year’s Gathering our vision is to create a non-profit Gathering where some sisters that are able to pay a higher price and maybe even donate become ‚Guardians‘ of the Gathering. This is balancing out the lower ticket prices and makes it possible for women to also achieve the ticket at low costs. If there is anybody who can not afford the ticket we will strive to find a solution within our present abilities. This is for the meaning of a community for us women living our sacred Womenhood, not for profit.